Donot mind the chevy. Just reference to a color it will be. Sweet color! 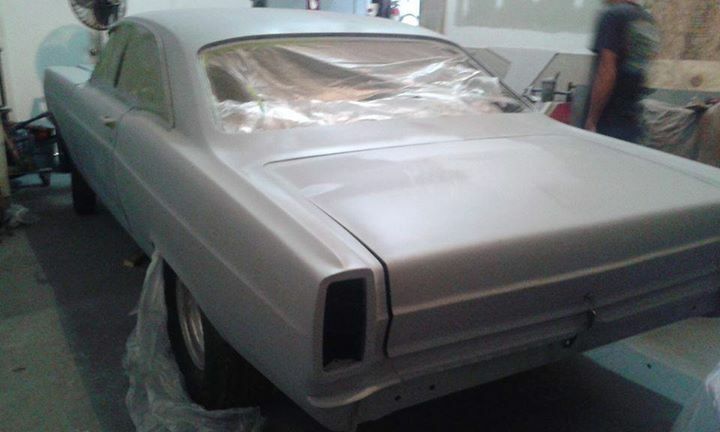 Looks similar to the color I just painted my 66 Fairlane. Enjoy the reassembly process, I am knee deep in wiring right now. WooHoo, found my xmas present. ST1200 lenco for sale local. Ok so what clutch/bellhousing did you use? Did you have to custom make something? I have a 61 galaxie that i plan on running a lenco in. it has a 511 side oiler in it and i'm having trouble finding parts to connect lenco to side oiler. I noticed that the responses in this forum are from way back, but I thought I'd give it a try. I have a 66 Fairlane 500xl, the interior has been replaced and a snap on the rear panel just above the arm rest has come out. Does anyone know how to replace the snap, the rivet didn't hold it in place. I not sure if there is a metal plate behind the panel..